"Philippine House" redirects here. For lower house of the Congress of the Philippines, see House of Representatives of the Philippines. 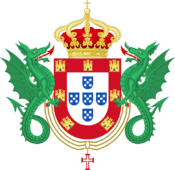 The Philippine Dynasty, also known as the House of Habsburg in Portugal, was the third royal house of Portugal. It was named after the three Spanish kings who ruled Portugal between 1581 and 1640 in a dynastic union of the two crowns. The three kings, all named Philip (Spanish: Felipe; Portuguese: Filipe, Portuguese pronunciation: [fɨˈlip(ɨ)]), were from the House of Habsburg. The history of Portugal from the dynastic crisis in 1580 to the House of Braganza monarchs is a period of transition. The Portuguese Empire spice trade was near its height at the start of this period. It continued to enjoy widespread influence after Vasco da Gama had finally reached the East by sailing around Africa in 1497–1498. Vasco da Gama's achievement completed the exploratory efforts inaugurated by Henry the Navigator, and opened an oceanic route for the profitable spice trade into Europe that bypassed the Middle East. Throughout the 17th century, the increasing predations and surrounding of Portuguese trading posts in the East by the Dutch, English and French, and their rapidly growing intrusion into the Atlantic slave trade, undermined Portugal's near monopoly on the lucrative oceanic spice and slave trades. This sent the Portuguese spice trade into a long decline. To a lesser extent the diversion of wealth from Portugal by the Habsburg monarchy to help support the Catholic side of the Thirty Years' War, also created strains within the union, although Portugal did benefit from Spanish military power in helping to retain Brazil and in disrupting Dutch trade. These events, and those that occurred at the end of the House of Aviz and the period of the Iberian Union, led Portugal to a state of dependency on its colonies, first India and then Brazil. Due to the complexity in the management of government, the Spanish Monarch needed some auxiliary bodies, as the Councils (Consejos), dedicated to the advice and resolution of problems, and submitted to the Monarch's knowledge and dictum. This complexity needed a permanent seat, and the king Philip II of Spain established in 1562 the permanent capital in Madrid, seat of the Royal Court and of the administrative staff. although transferred-in Valladolid, with the whole administrative staff, during a brief period (1601–1606). As for the functioning, the administrative correspondence came to the different Councils, to Madrid, then the secretary of every Council arranged the material that had to deliver for the attention of the king, and later the King assembled with the secretaries requesting the opinion of the Council. After that, the Council answered afterwards a session to treat the issue and to raise the formal consultation to the monarch. The secretary raise the consultation to the king, and was returned to the Council with his response to be executed. The meetings of the Councils took place in the royal palace, and they did not count on the presence of the king habitually. In this polisynodial system stood out for its importance, the Consejo de Estado (Council of State). 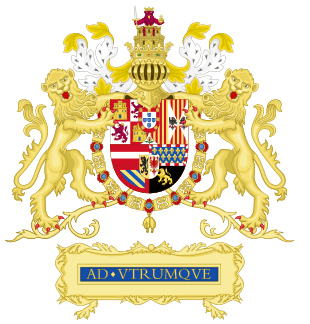 The Consejo de Estado in Madrid, entrusted to declare on the major decisions that concerned the organization and the defense of the ensamble of the Hispanic monarchy, and it had frequently that to get into Portuguese matters. Even, the Council of War (Consejo de Guerra) exercised its jurisdiction on the troops placed in the Castilian strongholds established on the Portuguese littoral. And also, there were Councils of territorial character, which functions specialized in a concrete territorial space, the Council of Castile, Council of Aragon, Council of Navarre, Council of Italy, Council of The Indies, Council of Flanders, and the Council of Portugal. The Council of Portugal, established in 1582, was integrated with a president and six (later four) counselors, and it disappeared in 1668. The function of the Council consists in representing close to the king the courts of the Crown of Portugal for the matters that depend on the justice, grace, finally, the economy of the royal Portuguese domain. Any decision of the king who concerning his Kingdom must do the object of a consultation to the Council before being transmitted to the chancellery of Lisbon and to the concerned courts. The Council of Portugal knows two eclipses: in 1619, for the presence of the King in Lisbon, and between 1639–1658, replaced with the Junta of Portugal. From the Restauração, the Council continued existing, since Philip IV had not recognized the independence of Portugal, and carried out the attending to the faithful Portuguese to the Spanish monarch, and the government of Ceuta. Council of State. The Conselho de Estado of Lisbon is the King's private Council, entrusted of debating major issues related to the Crown, especially as for foreign policy. The counselors could send their remarks to the king, and the King consulted them through his Viceroy. Although the Conselho de Estado of Lisbon, worked as the great adviser Council of the King's delegate, this Council of State was without clearly defined administrative powers and actually it did not perform relevant role of coordination. The Spanish kings maintained the system of two secretaries of state, one for the kingdom and the other for "India", that is to say, for the colonies, despite several conflicts over jurisdiction, until the creation of the Conselho da India in 1604. In the same way, Spanish kings retained the Mesa da Consciência e Ordens, which was both tribunal and council for religious affairs and was responsible for administering ecclesiastical appointments and for the property of the military orders in the colonies as well as in the home country. Also preserved was the Desembargo do Paço. The pinnacle of the entire Portuguese judicial system was the Desembargo do Paço or Royal Board of Justice in Lisbon. This board, the highest court in the kingdom, controlled the appointment of all magistrates and judges and oversaw the Casa de Supplicação or Court of Appeals in Lisbon, as well as the high courts in the Portuguese overseas territories. The first function of the Desembargo do Paço was to control the recruitment of the magistrates (leitura de bachareis) and to monitor them in the exercise of their charge, its control spreads to the whole of the juridical professions. The Desembargo do Paço had to arbitrate conflicts between other courts of the kingdom. This court granted dispensations, acts of legitimization and another relevant issues about the justice and the grace, and which on occasions advised the king on political and economic as well as judicial matters. Moreover, a commission of jurists set up to reform the legal system produced a new code for Portugal, the Ordenações filipinas, promulgated in 1603. The Casa de Supplicação and the Casa do Civel, both are two royal courts of appeal for civil cases as criminal cases. The Casa do Civel exercised jurisdiction over the northern part of the kingdom, and the Casa de Supplicação over the rest on the realm including the islands and overseas. From 1604, the newly created Conselho da India was invested with powers for all overseas affairs, apart from matters concerning Madeira, the Azores and the strongholds of Morocco, and colonial officials were appointed and their dispatches handled by it. However, it was the Conselho da Fazenda which dealt with naval expeditions, the buying and selling of pepper and the collection of the royal revenues, in fact with all economic business. The Conselho da India, therefore, exercised only limited powers. As a creation of the Spanish king, it was regarded with disfavour by the Portuguese and because of the jealousy of the Mesa da Consciencia disappeared in 1614. The joining of the two crowns deprived Portugal of a separate foreign policy, and Spain's enemies became Portugal's. England had been an ally of Portugal since the Treaty of Windsor in 1386. War between Spain and England led to a deterioration of the relations with Portugal's oldest ally, and the loss of Hormuz. English help provided by Elizabeth I of England in a rebellion against the kings assured the survival of the alliance. War with the Dutch led to invasions of many countries in Asia, including Ceylon (today's Sri Lanka), and commercial interests in Japan, Africa (Mina), and South America. Even though the Portuguese were unable to capture the entire island of Ceylon, they were able to keep the coastal regions of Ceylon under their control for a considerable time. Brazil was partially conquered by both France and the Seventeen Provinces. In the 17th, taking advantage of this period of Portuguese weakness, many Portuguese territories in Brazil were occupied by the Dutch who gained access to the sugarcane plantations. John Maurice, Prince of Nassau-Siegen was appointed as the governor of the Dutch possessions in Brazil in 1637 by the Dutch West India Company. He landed at Recife, the port of Pernambuco, in January 1637. 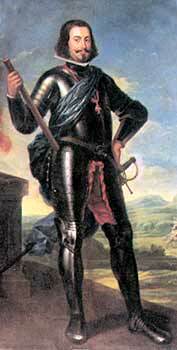 By a series of successful expeditions, he gradually extended the Dutch possessions from Sergipe on the south to São Luís de Maranhão in the north. He likewise conquered the Portuguese possessions of Elmina Castle, Saint Thomas, and Luanda, Angola, on the west coast of Africa. After the dissolution of the Iberian Union in 1640, Portugal would reestablish its authority over the lost territories of the Portuguese Empire. The Dutch intrusion into Brazil was long lasting and troublesome to Portugal. The Seventeen Provinces captured a large portion of the Brazilian coast including Bahia (and its capital Salvador), Pernambuco (and its capital Recife), Paraíba, Rio Grande do Norte, Ceará, and Sergipe, while Dutch privateers sacked Portuguese ships in both the Atlantic and Indian Oceans. The large area of Bahia and its city, the strategically important Salvador, was recovered quickly by a powerful Iberian military expedition in 1625. This laid the foundations for the recovery of remaining Dutch controlled areas. The other smaller, less developed areas were recovered in stages and relieved of Dutch piracy in the next two decades by local resistance and Portuguese expeditions. This situation culminated in a revolution by the nobility and high bourgeoisie on December 1, 1640, 60 years after the crowning of Philip I. The plot was planned by Antão Vaz de Almada, Miguel de Almeida and João Pinto Ribeiro. They, together with several associates, killed Secretary of State Miguel de Vasconcelos and imprisoned the king's cousin, the Duchess of Mantua, who had governed Portugal in his name. The moment was well chosen, as Philip's troops were at the time fighting the Thirty Years' War and also facing a revolution in Catalonia. The subsequent Portuguese Restoration War against Philip III (Portuguese: Guerra da Restauração) consisted mainly of small skirmishes near the border. The most significant battles being the Battle of Montijo on May 26, 1644, the Battle of the Lines of Elvas (1659), the Battle of Ameixial (1663), the Battle of Castelo Rodrigo (1664), and the Battle of Montes Claros (1665); the Portuguese were victorious in all of these battles. Several decisions made by John IV to strengthen his forces made these victories possible. On December 11, 1640, the Council of War was created to organize all the operations. Next, the king created the Junta of the Frontiers, to take care of the fortresses near the border, the hypothetical defense of Lisbon, and the garrisons and sea ports. In December 1641, a tenancy was created to assure upgrades on all fortresses that would be paid with regional taxes. John IV also organized the army, established the Military Laws of King Sebastian, and developed intense diplomatic activity focused on restoring good relations with England. After gaining several decisive victories, John quickly tried to make peace. 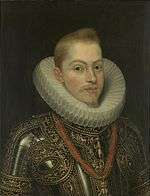 His demand that Philip recognize the new ruling dynasty in Portugal was not fulfilled until the reign of his son Afonso VI during the regency of Afonso's brother Infante Pedro (later King Pedro II of Portugal). 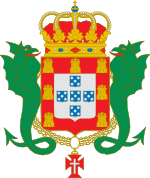 The Portuguese Royal House of Braganza began with John IV. 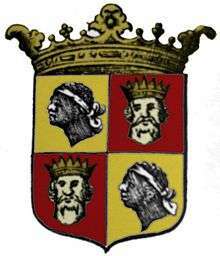 The Dukes of the House of Braganza were a branch of the House of Aviz created by King Afonso V for his half-uncle Afonso, 8th Count of Barcelos, illegitimate son of John I, first monarch of the House of Aviz. The Braganzas soon became one of the most powerful families of the kingdom and for the next decades would inter-marry with the main line of the Portuguese royal family. In 1565, John, 6th Duke of Braganza married Princess Catherine, granddaughter of King Manuel I. This connection with the Royal Family proved determinant in the rise of the House of Braganza to a Royal House. Catherine was one of the strongest claimants of the throne during the succession crisis of 1580 but lost the struggle to her cousin Philip II of Spain. Eventually Catherine's grandson became John IV of Portugal as he was held to be the legitimate heir. John IV was a beloved monarch, a patron of fine art and music, and a proficient composer and writer on musical subjects. He collected one of the largest libraries in the world. Among his writings is a defense of Palestrina and a Defense of Modern Music (Lisbon, 1649). Abroad, the Dutch took Malacca (January 1641) and the Sultan of Oman captured Muscat (1648). By 1654, however, most of Brazil was back in Portuguese hands and had effectively ceased to be a viable Dutch colony. John died in 1656, and his widow, Luisa of Guzman, married their daughter Catherine to Charles II of England in 1661 while she was regent for their son Afonso VI. Her dowry consisted of Tangier, Bombay and £1,000,000 sterling, making it the largest dowry ever brought by a queen consort. John IV was succeeded by his son Afonso VI. ↑ Anthony Ham. Lonely Planet Madrid. Books.google.com. p. 48. Retrieved 2016-10-26. ↑ John Horace Parry (1990). The Spanish seaborne empire. University of California Press. p. 196. ↑ Stephen J. Lee (1984). Aspects of European history, 1494-1789. Routledge. ↑ Torbjørn L. Knutsen (1999). The rise and fall of world orders. Manchester University Press. p. 138. ↑ Alastair Boyd (2002). The Companion guide to Madrid and central Spain. Companion Guides. p. 103. ↑ Stephen J. Lee (1984). 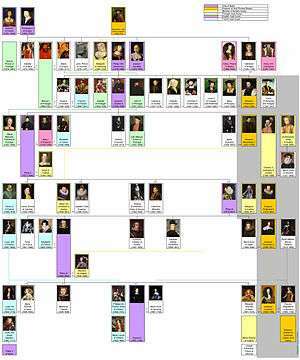 Aspects of European history, 1494-1789. Routledge. p. 40. ↑ Santiago de Luxán Meléndez (1987). La pervivencia del Consejo de Portugal durante la Restauración: 1640-1668. Norba. Revista de historia. pp. 61–86. ISSN 0213-375X. ↑ Julio Valdeón Baruque (1990). Revueltas y revoluciones en la historia. Universidad de Salamanca. p. 70.